This isn't a story about me, but I'm involved. You see, I used to teach a quilt class on the pattern "Pickle Dish". Many of my close friends took this class from me and started their quilts back in 1999. I got tired of making class samples, so I borrowed the students' blocks and sewed on them in later classes. This is the story of one of my close friends and her quilt. My friend, Lynn Patterson, decided to make her quilt HUGE and she decided to give it to her mother-in-law when it was completed. 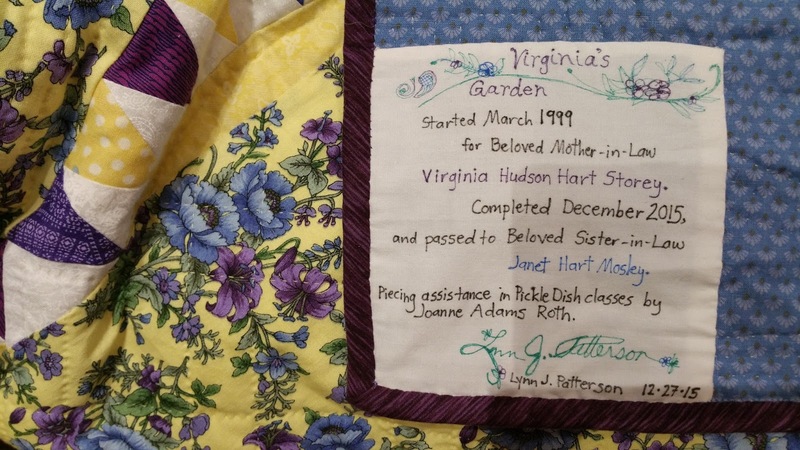 But before the quilt top got finished, her mother-in-law died in a tragic car accident. Talk about taking the wind out of your sails. 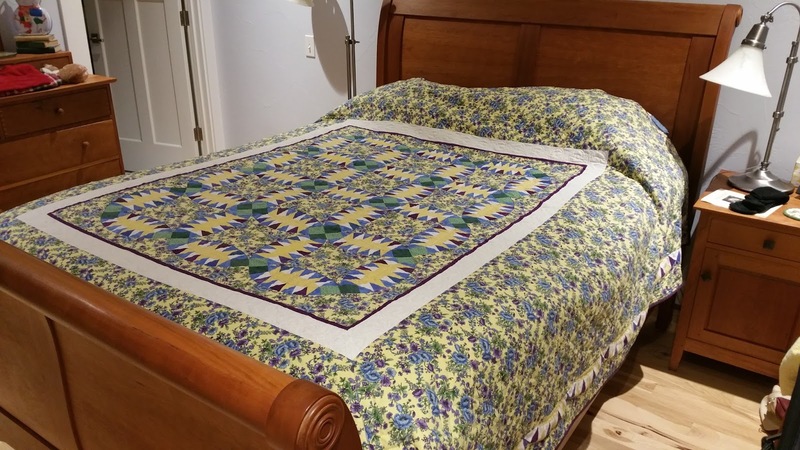 We all watched in agony for our friend as she sadly set aside this unfinished quilt. Seven years later she decided to give the quilt to her sister-in-law, so she pulled it out and started working on it again. Many years and many sewing hours later, she completed the top. Then she started the arduous process of hand quilting this huge quilt. She dragged that quilt everywhere and quilted like a demon. This year at the holidays, and 16 years after she started, she got the quilt done and gave it to her sister-in-law. I heard that there were tears everywhere when this generous gift was given away. 1999-2015 it says on the label. It also has her mother-in-laws name, her sister-in-laws name, her name. And wouldn't you know it, she even put my name on it. OK, now look who's crying! RIP Virginia.